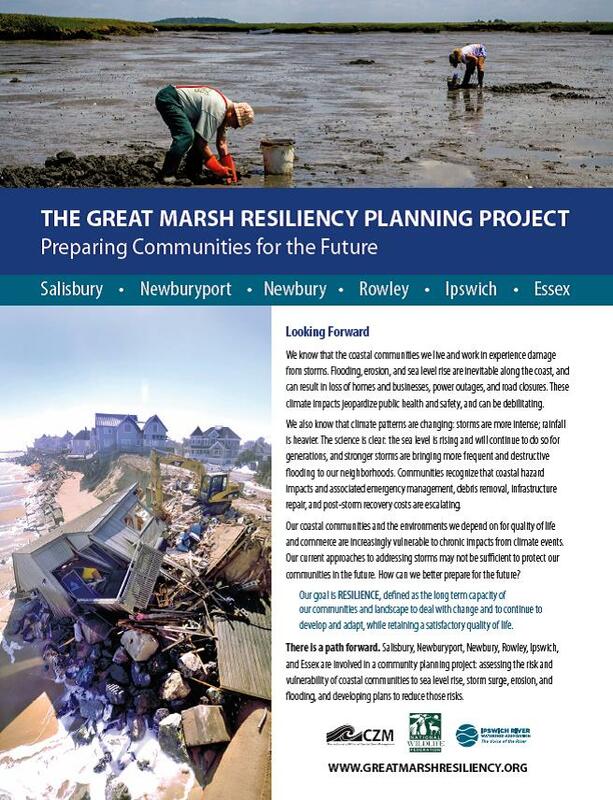 The National Wildlife Federation, US Fish & Wildlife Service, Boston University, University of New Hampshire, Ipswich River Watershed Association, Merrimack Valley Planning Commission, along with many other entities, make up the Great Marsh Resiliency Partnership (GMRP). The GMRP is working to enhance the resilience of the Great Marsh and reduce the vulnerability of neighboring communities. Community resiliency and adaptation planning. Located along the north shore of Massachusetts, the Great Marsh is New England’s largest contiguous barrier island and saltmarsh. The marsh provides critical habitat to state and federally listed species, sportfish, shellfish, and thousands of birds migrating along the Atlantic Flyway. The area is also home to 29 municipalities and millions of visitors that benefit from the ecosystem services? provided by the marsh. However, storm surge, sea level rise, and accelerating erosion have contributed to decreased marsh health and increased community vulnerability. As is commonly the case, adaptation planning in the Great Marsh must navigate a complex web of conservation, economic and political priorities, as well as multiple landowners and diverse management values. To address these cross-cutting challenges, the National Wildlife Federation is leading the GMRP in the execution of a $2.9 million dollar project funded by the Hurricane Sandy Resiliency Grants program. Displayed are maps from the National Wildlife Federation showing areas in the community vulnerable to coastal flooding, both now and in the future. Marsh Restoration: The marsh restoration team, led by the Merrimack Valley Planning Commission (MVPC), treated over 10,000 acres of marsh to remove non-native, invasive Common Reed (Phragmites australis) and Perennial Pepperweed (Lepidium latifolium) as well as invasive European Green Crabs across 1,280 acres. In addition, a team from Boston University (BU) reestablished submerged aquatic vegetation (SAV), including 3 acres of eelgrass in Essex Bay. They transplanted multiple eelgrass populations by hand to build a diverse population that will resist current and future stressors. Initial results indicate the restoration has been very successful, with 80% survival rates. Dune Restoration: Dunes on Plum Island and Salisbury Beach serve as a protective buffer? for coastal communities, reducing the impacts of sea level rise and storm surge on neighborhoods and nearby infrastructure. After severe erosion and storm damage, there is little or no vegetation to anchor the dune in place in many areas (which leads to even more erosion). To address these issues, the University of New Hampshire and Massachusetts Department of Conservation and Recreation (DCR), as well as local Conservation Commissions and other stakeholders, restored over 20 acres of priority dunes in Salisbury, Newbury, and Newburyport. DCR added over 18,000 cubic yards of sand along a one-mile stretch of heavily degraded dunes. A variety of native plant species were selected for their benefit to wildlife and their suitability to dune erosion and accumulation. Plantings and fencing techniques promoted dune stabilization, growth, and resilience. These efforts also included extensive stakeholder outreach and education; dune planting created an opportunity to engage schools and provided a “living classroom” where hundreds of students participated in the restoration work. Hydrodynamic sediment transport & salinity modeling have enhanced our understanding of sediment transport and erosional forces on barrier beaches, deposition patterns of sediment into marsh and tidal creeks, and of barriers to the natural flow of sediment. Increased understanding of salinity gradients informs management practices to increase the resiliency of natural habitats, such as the control of invasive plants. 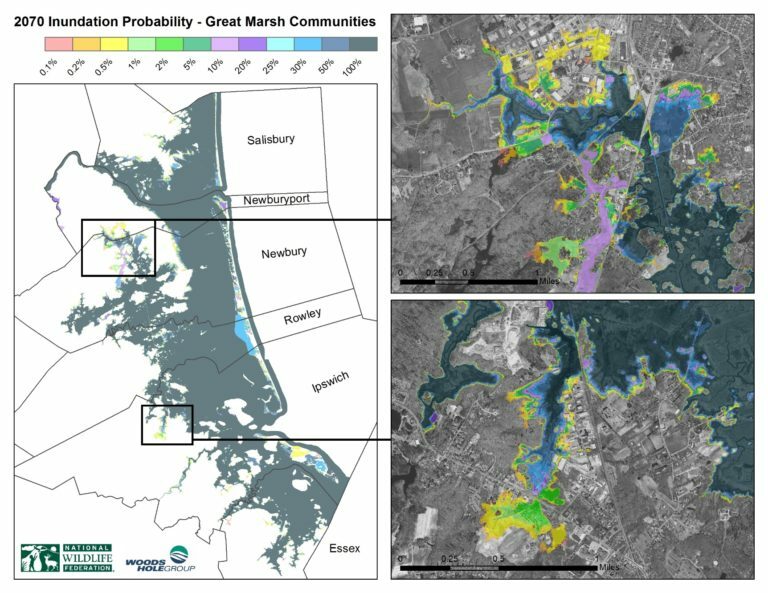 Scenario planning with this model has allowed managers to assess marsh and riverine restoration options and identify likely long-term effects. 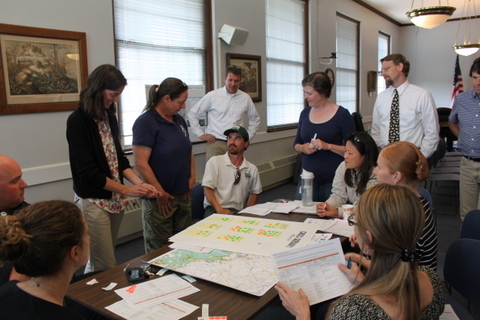 Ultimately the model will help pinpoint areas where restoration efforts will have maximum ecosystem-wide benefits. replace, or retrofit dozens of hydro barriers, with appropriate levels of support. Great Marsh Resiliency informational brochure. This 3 year project restored priority dunes that protect residential neighborhoods and public infrastructure from flooding. Invasive species control and reintroduction of submerged aquatic vegetation are reducing erosion in the marsh and tidal channels, providing important fish and wildlife habitat, and increasing the overall health and resiliency of the marsh so it can provide maximum ecosystem services? to its communities. Communities have preliminary design blueprints to upgrade or retrofit the top 100 high-risk hydro-barriers to reduce flood hazards and restore aquatic connectivity. The six shorefront communities have a draft Great Marsh Coastal Adaptation Plan that identifies shovel-ready risk reduction projects as well as municipal regulations and policies that incentivize climate-smart development and/or prohibit development in hazard-prone locations. In summary, this project reduced community vulnerability, broadened stakeholder engagement, educated decision makers, and increased the health and resilience of the Great Marsh.